Getting to Phi Phi Island by plane is not possible, meaning there are no air strips on any of the tiny islands. When you arrive there you see why; mountains, hills and cliffs make for spectacular scenery but this is not runway friendly! 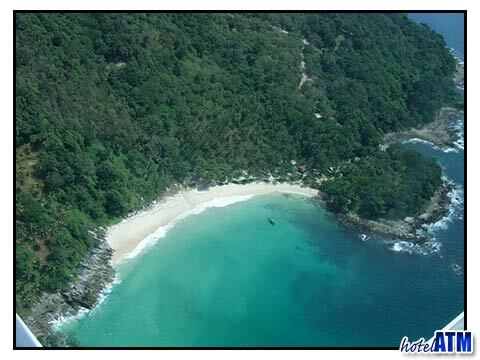 However you can get to Phi Phi Island by Seaplane with Destination Air. Destination Air has compact planes, 11 seats and they do get booked up in advance and so the majority of people get to Phi Phi by ferry boat, see below. In 2008 Captain Gerry Honigman became the Chief Pilot for Destination Air and he has over 20 years experience flying in Canada and Fiji. The planes take off from Phuket International Airport main runway and the check in is at the northern end of the terminal. The flight path follows some of the most dramatic views in Thailand. Destination Air heads off east over the Phang Nga bay made famous for the setting of the James Bond 007 Movie; Tomorrow Never Dies. The limestone cliff islands seem to cover the sea as far as the horizon. After about 5 minutes Destination Air flight move on to the mountainous scenery of Koh Yao. This island is covered with natural forests. As you approach the Phi Phi islands the Destination Air Flight brings you close to the cliffs of Thailand's wonder island, Phi Phi Don. Another famous movie was created on Phi Phi and on the days when you get to fly via Phi Phi Ley and Maya Bay you can see why the setting for "The Beach" became so iconic. Depending on the prevailing winds the landing site are chosen for maximum comfort though most of the flights touch down to the north near Laem Tong, on either the east or west side..
Destination Air is easy to book flights online or you can use many of the agents in Bangkok, Phuket or Phi Phi island to make the booking if you already in Thailand. Overland. On days when Destination Air doesn't fly you would need to take the ferry to Phi Phi. Some Phi Phi Island hotels offer direct transportation to their resort by fast speedboat from the Boat Lagoon in Phuket. But for most, the easiest and most comfortable transfer is by the big ferries from Rasada pier near Phuket town. Phuket Airport is located on the north side of Phuket Island and is considered the premier airport for a number of great holiday destination, including Khao Lak Krabi, Lanta Ao Nang, and Phi Phi. Thousands of people travel in and out of Phuket Airport daily and find it to be an easy airport to navigate to and from, as well as to navigate around. You can find relatively inexpensive transportation from the airport (limousine to the ferry 50 minutes to the pier is 10$ and then the ferry rides are about 10$ one way. There are also water taxis, boat charters and private charters owned by hotels and resorts on the island that will take you the last leg of your trip to beautiful Phi Phi island. You will need proof of identity and though a recent photo driving license is enough in many countries, unless it is a Thai driving license it is unlikely to be accepted. Thai Nationals can use their ID cards. When traveling to Thailand make sure your passport is up to date and you are aware of any Visa requirements for visitors from your country. Most travelers have no issues with visa requirements, but it is always a good idea to ensure that you are aware. It is also important that your passport is not set to expire within a month of your planned trip or you may not be allowed into the country. You want to keep your passport up to date and always get a new passport well before your existing passport is set to expire.